Have we got such short memories? Have we learned nothing from the war in Syria? Certainly the corporate media seems to think so because once again it’s implying that a suspected chemical weapons attack has been carried out by the Syrian government. The BBC is already claiming that if has footage that implicates the “Syrian government” in a chlorine gas attack in Aleppo. However, it’s worth reminding ourselves that similar claims were being made almost exactly three years ago about Al Ghouta. Then the BBC also inferred that that the Syrian government was responsible, even though there was little to substantiate those claims. Nor should we forget that it finally emerged that U.S. supported “Syrian rebels” had been behind Al Ghouta. With U.S. assistance they had staged the attack in an effort to stir Western public outrage against the Assad regime, thereby opening the way for direct Western military intervention in Syria. Fortunately that never happened after if became clear that the Western supported “Syrian rebels” were behind the attack. So before we jump to any conclusion, let’s just remember the media’s role in what happened at Al Ghouta. For the media is now an integral part of any modern war — as much as the actual combatants. With beguiling lies and deceptions, the media now often provided deliberately contrived pretexts for involvement in conflict. A woman and two children have been killed and dozens injured in an alleged chlorine gas attack in Aleppo, doctors have said, as experts warned that the frequent use of chemical weapons in Syria risks normalising war crimes. There have been dozens of attacks with chlorine gas since Syria officially agreed to give up its weapons stockpile following a 2013 sarin gas assault on a Damascus suburb, rights groups and doctors on the ground said. The latest reports came as Russia offered to halt fighting for three hours a day to allow aid into besieged parts of the city, but the UN countered by saying it needed at least 48 hours a week to take convoys through heavily bombed and mined roads into eastern Aleppo. There are still 1.5 million people living in Aleppo, the city that was Syria’s largest before the civil war and is now at the heart of the brutal battle for its future. About 300,000 civilians in rebel-held areas are at grave risk from water shortages and disease as fighting has intensified, said the UN envoy to Syria, Staffan de Mistura. Asked about the chemical attack on the Aleppo district of Zubdiya, he said there was a lot of evidence that it took place, and it would constitute a war crime if chlorine gas was used, but he added that it was not his remit to verify the attack. “If it did take place, it is a war crime and as such it would require everyone … to address it immediately,” he added. 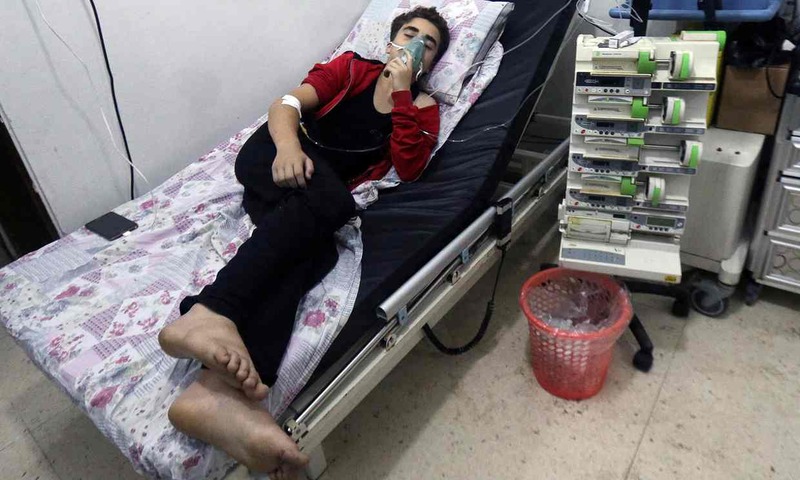 Last week, doctors in the neighbouring province of Idlib said they had treated more than two dozen patients following a suspected chlorine attack on the town of Saraqeb. The challenge of verifying the use of chemical weapons in a war zone, particularly chlorine – which disperses rapidly and does not leave a unique chemical trace when used as a weapon – has hampered efforts to track their use. However, the UN’s chemical weapons watchdog says it is confident that chlorine gas has been used as a weapon. It does not apportion blame but has said the bombs were probably dropped by helicopters used by forces loyal to Bashar al-Assad. The Syrian government denies using chemical weapons, and since the US president, Barack Obama, stepped back from enforcing his “red line” on their use, attacks have drawn nothing more than public condemnation from western leaders. Although most recent attacks have been relatively small, the toll of dead and maimed civilians and activists is mounting, and experts are concerned that the use of chemical weapons is no longer as shocking as it was a few years ago. “There is certainly a huge risk of normalising [the use of chemical weapons],” said Richard Guthrie, a British chemical weapons expert who has raised concerns about the wider impacts of Syria’s continued use of toxins as weapons.